For more than a year and a half (maybe two) I have encountered DROPPED FRAMES using ROXIO Creator NXT (Versions 5 & 6, regular and Pro) to capture video. 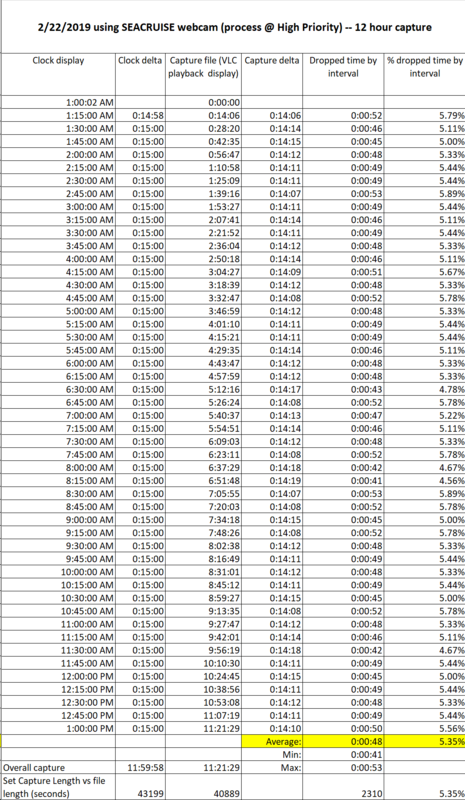 The result is around 3% - 6% dropped frames, uniformly across capture sessions ranging in length from 30 min to 12+ hours. Two of my other systems show nearly zero dropped frames! Pulled off the shelf and re-animated for this investigation and still able to run its original Creator 2011 Special Edition (MediaCapture13.exe file – Build 31B66A 701KB 7/16/2010 7:20 am). All of my systems, except ISSAC, run the latest version of Windows 10 (Feature Update 1803) and have successfully updated themselves over several years; all are virus checked, drivers are updated, image backed up, etc. I use Roxio USB dongles (two each of Model MU3192-E and Model MU3180-E) from various Easy VHS to DVD 3 Plus packages and the Creator NXT MediaCapture15 program. Capture quality is set to HQ (MPEG-2 720x480). Running MediaCapture at different Windows task priorities: Normal, Above Normal or High. Of special note, the USB dongle connection on ISSAC is via an Express Card USB 3.0 two-port adapter, and yet it has almost no dropped frames! All other dongle connections are native USB 3.0. With one exception, noted next, files on all systems are to captured to their respective second, non-OS internal hard drive (‘PEGASUS’ to a separation partition). MERLIN has a very small system drive (128 GB SSD) with very limited free space, so its captures are directed to an external hard drive (via another Express Card USB 3.0 two-port adapter). And yet, as recently as mid-February on MERLIN, there were three captures (from a DVR) that showed almost no dropped frames: Two files were approximately three hours each (total of four seconds dropped), and the third was a five hour capture with 20 seconds dropped. Otherwise, most captures on MERLIN (before and after) follow a more typical 5% drop pattern. Yet another unexplained anomaly. At the end of Nov 2017, I bought a new Dell XPS 8930 desktop system (‘PEGASUS’) and I was shocked to discover that it immediately showed the DROPPED FRAMES anomaly! At the time, I decided to pursue this problem more aggressively, since (a) it occurred on a brand new high-powered desktop system and (b) was using the newest version: Creator NXT 6 Pro. 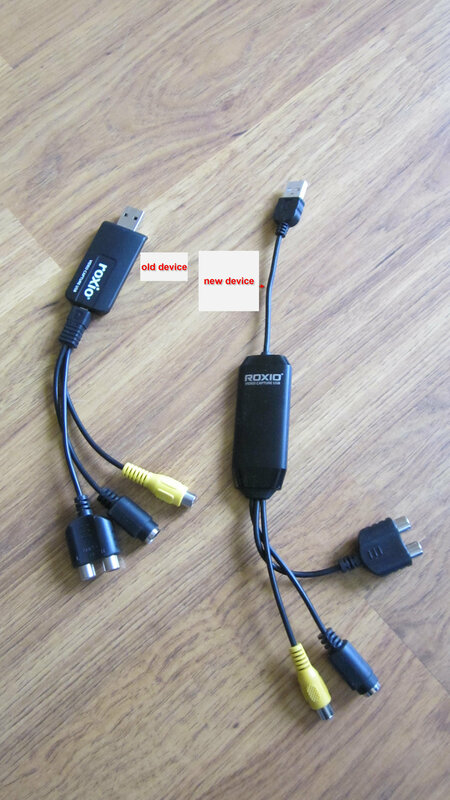 Over following two months I tried almost every possible combination of video sources (DVR recordings & Live TV); different audio/video cables, different USB capture dongles on different systems, different USB ports. Creator was re-installed multiple times (incl. with absolute minimal software), drivers were checked, updated, removed, and re-installed. The dropped outcomes were unchanged; the results remained correlated with each system as cited above. During that period, Jan-Feb 2018, I sent many copies of these results to ROXIO Technical Support and urged them to try duplicating and confirming my experience. I got nothing back and had to give up when my schedule was pressed with other, non-computer matters. Toward the end, I was shuffled around to other technicians, having to explain everything from scratch each time. There were no effective suggestions offered amid very long periods with no replies at all. During the Spring and Summer of 2018 I traveled quite a bit and I could only check-in a couple of time with Tech Support for status updates. I got no replies and gave up once again. Now, after a year away, I am trying to reopen this issue. While traveling, I discovered a decades old, large LCD clock at my brother’s house, and hit upon a much simpler and more straight-forward way to demonstrate this problem, minimizing extraneous factors like video sources, cables, etc. Using the laptops’ the built-in webcams, I captured the displays of that digital clock using MediaCapture15 (MediaCature13 on ISSAC) with source set to CyberLink Webcam Splitter. Let’s see if the drop conditions still happens with these configurations! Yes, they do! In one recent 12 hour capture session, the SEACRUISE file showed consistent dropping of 41-53 seconds worth of frames over each 15 minute clock interval (average drop was 5.35%). Occasionally, at interval boundaries, there was obvious skipping / jumping in the video display and in the audio (background from a live TV broadcast). In contrast, at the end of a six hour clock capture on 2/26/2019, the AVALON capture file differed from the clock by THREE SECONDS and at the end of a six hour clock capture on 2/27/2019, the ISSAC capture file was different from the clock by only 20 seconds. For the re-opened support ticket, I have submitted the requested WinAudit and msinfo32 diagnostic files (again – this time for SEACRUISE) to ROXIO Tech Support but with very low expectations that anything substantive will happen. It has been a week already with no feedback. I also sent along an interval comparison spreadsheet, from that 12 hour clock capture run at High Priority, and screen shots showing the drift, over one four hour interval, of 5.42% between the displayed clock and the playback file progress bar. I can make these items available on the Users Forum if anybody is interested. As I experienced more than a year ago, ROXIO Tech Support seems, once again, totally unwilling to try replicating my experiments on their equipment or perhaps, even more unwilling, to share their results. I simply cannot understand ROXIO’s reluctance to investigate. I have reported a serious defect in their products, across multiple PC, and yet one that is not present in some other PCs. ROXIO continues to add capture capabilities to its newer software (3D, multiple camera) and yet my problem is at a more basic ‘Feature 101’ level: A simple webcam capture. This problem spans different Windows versions and PCs built across almost 10 years – including a brand new, state-of-the-art model – by two different major manufacturers (Dell and HP); and yet does not seem to be present in an 11 year old laptop running Windows XP using an eight year old release of ROXIO software. Has testing ever revealed this problem? When did this issue suddenly ‘re-appear’? How do they test ‘video capture’ anyway? That itself has to be called into question given my results. What systems (vendor, model, configuration) does ROXIO use in development, in testing? Maybe I should buy what they are using! Maybe nobody ‘out there’ in the user base actually uses Creator to capture their webcams or their parents’ 35 year old wedding videos! That might be one explanation for why I see no similar complaints for this on the Forum: Nobody uses it! Seriously, an investigation suite would be : a laptop, a webcam and a digital clock! And how much effort can this be? Launch a 2:00 hour capture, 3:00 or more if you thrive on data, shower, feed the dog and go to a movie! It’s akin to watching paint dry; not exactly rocket science! So I am hereby issuing a ROXIO Creator Users’ call-to-action! Some of you, perhaps several of you: Please try what ROXIO will not: RUN THE CLOCK CAPTURE! REPORT BACK WHAT YOU FIND! The more different systems that are tried in this experiment, the better with be the chances of figuring out what is at the root of this persistent and vexing problem! Good luck and thanks in advance for any ‘contributions’! Using a video calculator that would be 131.84 GB of hard drive space and 12 hours of capture. Have you ever tried 1 hour captures in your dropped frames testing? As I stated in the OP, the frame drops are uniform across all time intervals. For example, 41-53 seconds THROUGH-OUT all 15 minute intervals in the 12 hour capture I reported above (see spreadsheet below). Near as I am familiar with once the first 15 minutes of capture is completed, with drops, the ROXIO software cannot go back in time and undo those drops, so a 1 hour capture would not make any difference! I did not check in with Dr. Who though. Math check note: 12 hr capture file (MPEG-2) is 41,825,392 KB or 39.89 GB (1024-based units). Then there is that annoying: Why was this not a problem 8+ years ago in Creator 2011 running on lowly Windows XP? And still not a problem in 2019! And why does AVALON, a more modern WINDOWS 10 laptop, not show this DROPPED FRAME condition now; but SEACRUISE and PEGASUS, of even most recent vintage, running Creator NXT 6 Pro, still have this problem. And where is ROXIO Tech Support in all of this? Still nothing from them after I sent in the diagnostic files they wanted. Not sure which time zone they are in, but now encroaching on a week since, with no reply: "Submit a ticket Email us and receive a response within 24 hours." I guess that only applies to the very first email sent in. Maybe I should post the entire saga on an AMAZON review. Perhaps somebody out there can RE-RUN THE CLOCK CAPTURE EXPERIMENT to verify this sad state of affairs. No one I know does 12 hour captures! You can do what you want and experience the problems you have, write lengthy posts, and post graphs. Perhaps you should invest in professional software instead of consumer software? For crying out loud: 12 hour was just a test! Trying to ID a time cycle / variance. Set Capture Length does not seem to have much of a parameter limit! I write "lengthy" because NOBODY seems to believe me (or anyone) when there is a problem, even when presented with abundant evidence of a problem. My mistake is that perhaps I assumed that evidence was cared about; perhaps not in our current political era. You seem to be belittling my experience by saying: It is my fault that I used a feature, within its parameters, and my fault when I discovered a fall short? Huh? Well it sort of worked! Would it have been better if I showed 5% drops on a 5 minute CLOCK? I can do that if it makes people happier! Glad I did not bother uploading the 40GB file to my DropBox - frankly nobody gives a #&#036;^@! Professional vs consumer? Exactly! You get what you pay for I guess. Consumer grade: bugs and rip-offs okay; keep buying it SUCKERS! No HOLLYWOOD production company would tolerate this sort of thing! 3 minutes of drops in an hour would be $15M worth of commercials in the Super Bowl! So NOBODY else (aka consumers) uses ROXIO Creator to capture anything (me doing what I want)? Must be why they sell VHS to DVD software I guess: Does it do webcam captures? Probably not! And surely won't record anything longer than a 6 hour VHS tape; I seem to recall that limitation. On occasion I need longer. And NOBODY at ROXIO adequately tests any of their ONE STAR software (mine is not the only complaint on Amazon): Once upon a time it worked for me (2011), now it sort of doesn't. How else could something this fundamental have survived into the NXT 6 release (and now NXT 7 I presume)? And all of those FORCED, MANDATORY ROXIO software upgrades because of Windows 7, Windows 8.1, Windows 10, induced "incompatibilities". 95%? Good enough for consumers! I get it now: Drops are the price for being able to run at all on Windows 10! You want 100% CAPTURE? Stick with Windows XP and Creator 2010, 2011, 2012! Right now I am JUST CURIOUS as to how this bifurcation could happen (works on some, doesn't on others?) I have no mental model or theory on this... Curious that there is no curiosity out there on this conundrum. I can understand the "ROXIO politics" of not having the huge user-base / of having limited bug fix resources / etc to investigate this and not being in a position or able to admit that -- we can't help him / fix it, so just remain quiet, ignore him and he will eventually go away. That is the only mental model I have right now. My apologies. Just frustrated here with being totally ignored for years. My mistake for coming to the Forum for help instead of insults (used to it); sorry to waste your time. Giving it another week to see if anybody else weighs in! Getting ready to walk away again; wait me out. It is what gurus do. Growing impatient with the professional Tech Support, you have come here. After writing a tome and " thanks in advance for any ‘contributions’! " you leap straight down the throat of the first volunteer who asks a question of you, and start hurling abuse at anyone or anything you can see. If that's the way you respond to efforts to help you, I can see why people are reluctant to engage with you. The Gurus on this bulletin board are not paid Roxio support people, they are users of the software who volunteer their own personal time and experience to try and help others with problems. If you can't accept that, and treat other people here with respect, then this board is not for you. Please moderate your behavior or walk away right now. Somewhere along the way, the drivers were changed to the new capture device, if you use W-10 and the new device use NXT3 or above. I would use a W-7 PC with as much horsepower, video card, and fastest hard drive you have, with Creator 2011 Pro or 2012 Pro with the older capture device and capture in AVI. Where do I buy new devices pictured above? Wish I could - Easy VHS packages available only sell old device. Thanks! Sorry, my bad! I looked again! : Only now have NEW DEVICES! I threw out all of the OLD DEVICES last year. Below: This is where things were left w/ Tech Support last year, May 2018. I omitted my personal file copy footnotes. Reading tea leaves, it seems like they replicated the problem to some degree and appears nothing could be done. Never got any more follow up. Maybe I will try a copy of NXT 7. Does it contain a more recent capture driver ala embda64a.sys (dated 5/4/2012 12:08 pm)? FWIW: AVALON, overnight, another routine perfect capture, 11 hours, 41GB, no drops. Perhaps AVALON would command a premium on eBay? Same with GORDON, another HP 17" laptop, pressed back into service for data collection: Perfect 4-0 on captures recently but has an issue with having TWO external monitors (above ROXIO device driver has BSOD twice when dragging an open program window onto the display driven by a USB-to-HDMI adapter. Random, not repeatable on-demand). I filed a new, separate ticket for this, but suspect that this will be too rare for anybody to have encountered it before. Since GORDON is my day-to-day workhorse, once again being retired from capture duty. 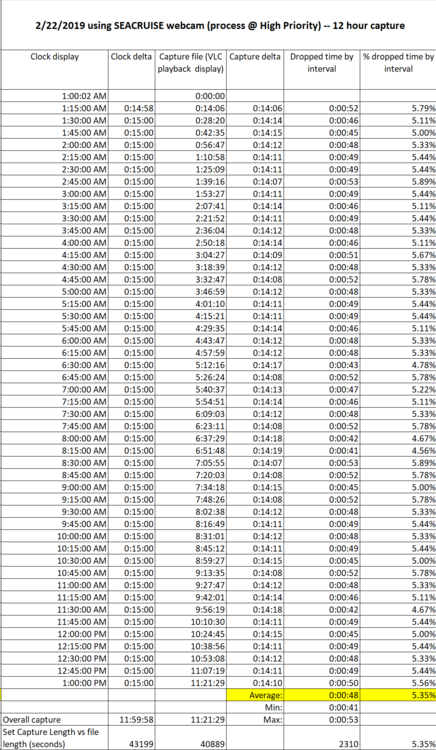 Attached spreadsheet: SEACRUISE 31 min clock capture summarized; same as always. Just one of those frustrating, insoluble, explainable digital conundrums that we all have to live with from time to time. I think this will pretty much wrap things up here on the Forum.... Thanks for your efforts. Your request (4771968) has been updated. To add additional comments, reply to this email. It seems that all your information provided needs to be further checked by our Dev Team(1). · Capture Device may also be checked to ensure that damages weren't done(11). May need to check any significant issues regarding damages, just in case.